Disk quotas come in handy and allow system administrators to equitably distribute disk space among multiple users in shared servers or PCs. This avoids a situation where a careless user ends up filling the entire hard drive and wreaking havoc in the system. However, quotas do not always work as intended. As easy as it may seem in setting up disk quotas, sometimes things may go a bit askew. Occasionally, users can get allocated a volume of disk space which is less than what was specified in the settings. This usually happens when the server runs out of space. However, there are situations where you may get the impression that they have received less hard drive space than what was configured. The reason behind this is the misconception that shrouds the meaning of quota allocation when it comes to a user’s files. What users do not realize is that quotas take into account all files that are owned by a user. And this includes files in the recycle bin. This is true especially if disk quotas are implemented on local PCs. Since the recycle bin resides on the PC, this is scenario or discrepancy is most likely to occur. Another unusual thing that may arise is the unavailability of space despite a user relinquishing the ownership of their files. A user may create a file, change its ownership but still, the file will be counted in the quota. Another confusing scenario is the use of compressed folders. Windows looks at compressed folders not in their compressed size, but rather, in their original size. This means that quotas look at compressed files in their original uncompressed format, not according to the current size they occupy on the hard drive in their compressed format. Sometimes, when the disk space limit is exceeded, the user may realize that deleting files in the volume may not free up space as expected. This occurrence has been noted in Windows Server 2008 R2. This happens due to incorrect filling of the file content structure when the deletion happens. For instance, the above command will apply on scratch folder located in users directory. After running the command, reboot the system to effect the hotfix settings. This occurs because the file context structure is not filled in correctly when you delete the files. In case a user is using a system whose hard drive is formatted using FAT or FAT-32 filesystem, they’ll be required to format it to NTFS filesystem since NTFS filesystem is the only filesystem that acknowledges the concept of quotas as well as file ownership. This compels the system administrator to first perform a file backup of the files contained in the FAT & FAT-32 partitions and later format the volumes to NTFS filesystem. This can be quite tedious and cumbersome. It’s therefore important to ensure all volumes are formatted in NTFS filesystem if you are planning to have several users using or backing up data in the system. This is because disk quotas only work with NTFS volumes only. In the previous post, we looked at the disk quota functionality and how quotas are handy in limiting disk space utilization for shared systems. This is crucial in ensuring that all users get equal space allocation and systems’ performance is kept at an optimal level. In this post, we’ll take a practical approach and see how we can manage and control disk space utilization to prevent users from filling up the hard disk and leaving no more space for anyone. To recap some of the important features about disk quotas, the quota can only be applied to volumes which have been formatted in NTFS filesystem. They are mostly used in corporate networks but can as well be used on a home PC running Windows OS including the basic Windows 10 home. You can choose to set quotas per individual user or apply them on everyone. However, you cannot implement limits on groups. For best practices, quotas should be configured or set per volume basis and not per computer, and upon execution, newly added users will begin using them as expected. That said, let’s dive deeper and see how you can implement this functionality to manage and control hard drive space utilization. Fire up the File Explorer. This is done by using the (Windows key + E) shortcut. On Windows 10, Locate This PC tab and click on it. Under “Devices and drives,” right-click on the preferred drive that you wish to manage. In the menu that appears, select Properties option. Click the Show Quota settings tab. The Quota status Windows will open. Check the first option, which is the Enable quota management option. Just below the option in 6 above, Locate and Check the Deny disk space to users exceeding quota limit option. This option enables disk space limitation. In case the account you want to restrict is not listed, click Quota, and select New Quota Entry. Next, click on the Find Now button. At the bottom of the Windows, a list of user accounts will be listed. Select the account you’d want to effect limits on. Press OK again in the previous Window. Select the Limit disk space to radio button option. Set the desired volume of space you’d want and specify the restriction unit size (for instance, MB, GB or TB). Set the preferred space size before a warning is triggered and specify the size unit (for instance, MB, GB or TB). After following and completing the above procedure, the quotas will take effect immediately users login in. Users will be restricted to the amount of disk space size set and get a warning when approaching the limit as specified in step 16 and 17 above. Fire up File Explorer. This is done by using the (Windows key + E) shortcut. Under the “Devices and drives,” section, right-click on the preferred drive that you wish to manage. In the menu that appears, select Properties option. Hit on the Quota tab. Next, Locate and Check the Deny disk space to users exceeding quota limit option. This option enables disk space limitation. Select the Limit disk space to option. Set the desired amount of space and specify the size unit (e.g., MB, GB). Set the amount of space before a warning is triggered to the user and specify the size unit (for example, MB or GB). Once you completed the above procedure, all accounts on your system will now be able to use part of the total available disk space storage. A warning will be triggered to alert or warn users that they’re approaching their maximum storage quota. Should the threshold be reached, users will no longer be able to create and store any more files on the volume. They will either have to delete existing files or move them to another location. If you decide that you no longer want to put restrictions on the hard disk volume users can use on a drive, you can use the same instructions. In step number 8, select Do not limit disk usage option and uncheck the Deny disk space to users exceeding quota limit as well as the Enable quota management options. In summary, we have seen how you can plan and implement disk quotas on Windows Systems, both on per user account and volume basis. In the next post, we’ll see some of the challenges that are likely to occur and how you can go around them. Windows Server system comes with a very handy feature that allows the creation of many user accounts on a shared system. This enables users to log in and have their own disk space and other custom settings. However, the drawback with this feature is that users have unlimited disk space usage, and with time, space eventually gets filled up leading to a slow or malfunctioning system, which is a real mess. Have you ever wondered how you can avert this situation and set user limits to disk volume usage? Worry no more. To overcome the scenario described above Windows came up with the disk quota functionality. This feature allows you to dictate or set limits on hard disk utilization space such that users are restricted to the size of disk space they can use for their files. The functionality is available for both Windows and Unix systems like Linux that are being shared by many users. In Linux, it supports ext2, ext3, ext4 and XFS filesystems. In Windows operating systems, it’s supported in Windows 2000 and later versions. It’s important to point out that in Windows, this functionality can only be configured on NTFS file systems only. So, If you are starting out with a Windows server or client system, you may to consider formatting the volumes to NTFS filesystem to avert complications later on. Quotas can be applied to both client and server systems like Windows server 2008, 2012 and 2016. In addition to that, quotas cannot be configured on individual files or folders. They can only be set on volumes and restrictions apply to those volumes only. To be able to administer a disk quota, one must either be an administrator or have administrative privileges, that is, be a member of Administrator’s group. The idea behind setting limits is to prevent the hard disk from getting filled up and thereby causing the system or server to freeze or behave abnormally. When a quota is surpassed, the user receives an “insufficient disk space error” warning and cannot, therefore, create or save any more files. A quota is a limit that is normally set by the administrator to restrict disk space utilization. This will prevent careless or unmindful users from filling up the disk space leading to a host of other problems including slowing down or freeing of the system. Quotas are ideally applicable in enterprise environments where many users access the server to save or upload documents. An administrator will want to assign a maximum disk space limit so that end users are confined to uploading work files only like Word, PowerPoint and Excel documents. The idea behind this is to prevent them from filling the disk with other non-essential and personal files like images, videos and music files which take up a significant amount of space. A disk quota can be configured as per user or per group basis. A perfect example of disk quota usage is in Web hosting platforms such as cPanel or Vesta CP whereby users are allocated a fixed disk space usage according to the subscription payment. A soft limit, on the other hand, can temporarily be exceeded by an end user but should not go beyond the hard limit. As it approaches the hard limit, the end user will receive a string of email notifications warning them that they are approaching the hard limit. In a nutshell, a soft limit gives you a grace period but a hard limit will not give you one. A soft limit is set slightly below the hard limit. If a hard limit of, say 20G is set, a soft limit of 19G would be appropriate. It’s also worth mentioning that end users can scale up their soft limits up to the hard limit. They can also scale down their soft limits to zero. As for hard limits, end users can scale them down but cannot increase them. For purposes of courtesy, soft limits are usually configured for C level executives so that they can get friendly reminders when they are about to approach the Hard limit. In summary, we have seen how handy disk quota is especially when it comes to a PC or a server that is shared by many users. Its ability to limit disk space utilization ensures that the disk is not filled up by users leading to malfunctioning or ‘freezing’ of the server. In our next topic, we’ll elaborate in detail how we apply or implement the quotas. Most common File System Attacks on Microsoft Windows Server systems are an Active Directory targeted attacks, which is, based on a fact that AD is a “heart” of any Windows-based system. The bit less common, but still, very dangerous ( and interesting), can be File system attacks. In this article, we investigated most common ways of filesystem attacks and protection against it. The goal of File System Attacks is always the data, pieces of information stored on a server, important for any reason to any side that planned an attack. To get to data, first thing, attacker needs are credentials, as more elevated account, as better. In this article, we will not write about credentials theft, that could be a topic for itself, but we will assume, that attacker already breached organization, and got the Domain administrator credentials. The first step is finding the Data, a place where it “lives”. So with a usage of Smbmap’s features, attackers will find all the file shares on those hosts and determine what sort of access, Permissions, and more detailed info about any file share on the system. Another common way of determining the data location is PowerShell based. By definition – PowerSploit is a collection of Microsoft PowerShell modules that can be used to aid penetration testers during all phases of an assessment. And like smbmap, PowerSploit has a huge number of features. For finding data shares, attackers use Invoke-ShareFinder cmdlet, which will, in the combination of other PowerSploit features, show exactly the same things as smbmap, that means all information necessary to access and use data. Of course, examples, above, are a just brief description of attacks that can list your data shares to the potential attacker, but, no matter, it is clear, that listing your data is a first step to getting it. Monitor first time access activity – this is more an admin tip than a protection method, but it can be important. If you notice, a user has a right to share but never used it, and all the sudden, activity on that account changes, and steps out of “normal”, it could be a sign that account credentials are hijacked. Check for potentially harmful software, not as malware, but a hint. SmbMap is built in python, so if noticed, sudden installation of python software, or PowerSploit module on your system, that could be an early alarm that something suspicious is going on your servers. So now the potential attacker know where the data on our hypothetical server “ live”. The next step is narrowing the data down on “interesting”. There could be huge amounts of files in even the smallest organizations. How can attacker know which data is one he/she need. With PowerSploit, functionality used is called Invoke-FileFinder. It has a lot of filtering options, to narrow down data to “interesting”, and export it to CSV files, which allows attacker to explore it on his own system with wanted pace, and after detecting it, attacker can make a targeted attack, and get needed files to staging area, and transport them out of the network ( via FTP, or even Dropbox trial account). The same thing happens with SmbMap. Just as PowerSploit, it will filter out the data with options, the tool can provide, and show the data, the attacker is interested in, with the same outcome, getting pieces of information. With this example, a hypothetical attack is in the second phase. The attacker, successfully listed files and found the most interesting ones. The easy part is left undone. Just taking the data. How to protect from that? Together with earlier mentioned methods, the following can help administrator fortify system and files. Password rotation – Can be very important action, especially for services and applications that store passwords in filesystems. Constantly rotating passwords and checking file content can present a very large obstacle for the attacker, and will make your system more secure. Tagging, and encryption – In combination with Data Loss Protection, will highlight and encrypt important data, which will stop simple type of attacks, at least, getting important data. The final part of the file system attack. In the hypothetic scenario, we had listed and accessing data on the penetrated system. And here we will describe how attackers persist in the system, even when they get kicked out the first time. Attackers hide some of their data into the NTFS file system, more accurate, in Alternate Data Stream ( ADS). Data of a file is stored in $DATA attribute of that file as NTFS tracks it. Malware vendors, and “bad guys” are tracking ADS and use it for entrance, but still, they need credentials. So as usual, they can be stopped by correct permissions usage, and not allowing “write” permission to any account that is not specifically assigned for write operations. File System Attacks are tricky, but they are leaving traces, and in general, most of the attacks should be prevented by System Administrator behavior and predictions. In this field, we can fully say: it’s better to prevent than to heal, and it is clear that only knowing your system fully, and full-time administration and monitoring will/can make your system safe. Do you want to avoid Unwanted File System Attacks on Microsoft Windows Server? NFS (Network File System) is a client-server filesystem that allows users to access files across a network and handle them as if they are located in a local file directory. It is developed by  Sun Microsystems, Inc, and it is common for Linux/ Unix systems. Since Windows Server 2012 R2, it is possible to configure it on Windows Server as a role and use it with Windows or Linux machines as clients. Read to know about How to Configure NFS in Windows Server 2016 here. Installation of NFS (Network File System) role is no different than an installation of any other role. It goes from “Add roles and features Wizard”. With few clicks on “Select server roles” page, under File and Storage Services, and expansion of File and iSCSI Services, the system will show checkbox “Server for NFS”. Installation of that role will enable NFS server. After installation, it is needed to configure role properly. The first stage is choosing or creating a folder for NFS (Network File System) share. With right click and properties option, the system will bring the NFS Sharing tab, and Manage NFS sharing button, as part of the tab. It will provide NFS Advanced Sharing dialogue box, with authentication and mapping options, as well as with “Permissions” button. Clicking on “Permissions” button will open Type of access drop-down list, with the possibility of root user access, and permission level. By default, any client can access the NFS shared folder, but it is possible to control or limit the specific clients, with a clicking of Add button and type the client’s IP address or hostname. The steps above make NFS (Network File System) server ready for work. The command maps folder as drive and assigns chosen letter to it. No matter NFS is common to Linux / Unix systems, it is still needed to mount folder to a system via command, similar to windows systems. Resilient File System (ReFS) is Microsoft’s latest file system that is an alternative to the New Technology File System (NTFS). ReFS has been introduced for implantation of systems with large data sets to give more functionality in terms of efficiency, scalability, and availability. An outstanding feature of ReFS is data integrity which protects data from common errors that may lead to data loss. In case of an error in the file system, ReFS has the ability to recover from data loss without compromising the volume availability. On the other hand, ReFS is a robust file system with proven reliability and it is time and cost efficient when used on servers. The key elements of a Resilient File System are dependent on the amount of data the server system manages. The main reason behind this feature is to avoid data corruption because of its ability to provide cloning of course database simultaneously without straining available storage space. All forms of torn writes are eliminated using the Allocate on Write method. This implies that the file stored on ReFS partition can be read and written on a single instruction. The servers store a lot of information and limitless sizes of files and folders. The ReFS scalability element means that the file servers can handle large data sets efficiently. A B+ Tree file structure also enables data to be stored and retrieved in a tree structure with every node acting as keys and pointers to low level nodes in the same tree. Integrity streams allow for the use of checksums on stored data enabling the partition to query the reliability and consistency of the file. Fault tolerance and redundancy is maintained through data striping. Power shell commands such as Get-FileIntegrity and Set-FileIntegrity can be used to manage file integrity streams. ReFS allow for repair of data files with an alternate copy found in the storage space. This is made possible when used alongside disk mirroring. The repair and replacement takes place online without the need to unmount the volume. When data is corrupted and no original copy of it exists in the database, ReFS will remove the corrupt data from the namespace while keeping the volume online. The Resilient File System allows for data integrity check in addition to validation before any read or write action. The integrity check will occasionally scan through volumes to identify potential errors and trigger a repair action. Working with ReFS can be used alongside volumes using the New Technology File System (NTFS) because it still has support for key NTFS features. When backing up data or transferring files from partitions using ReFS, the time taken during read/write actions is reduced compared to backing up data in an NTFS partition. The parity mode ensures that the system delivers both efficient data storage and high performance. The volume is divided into two logical storage sectors, each with its own drive properties and resilient types. Hard Disk files from minutes to seconds. The ReFS allows for the creation of both 4K and 64K file cluster sizes. In other file systems, 4K is the recommended cluster size. But the ReFS accommodate the 64K because of its large and sequential input /output file requests. The ability to support large data sets without having a negative impact on system performance is by far the best file deployment system in terms of scalability. 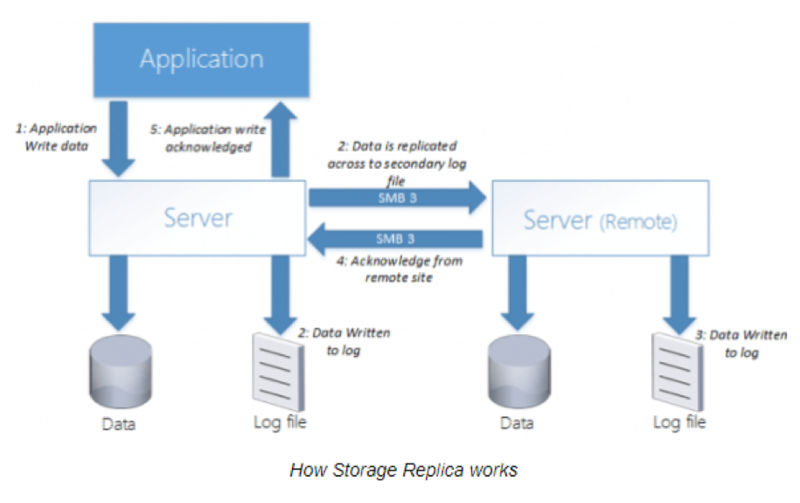 Shared data storage pools across the network enhance fault tolerance and load balancing. ReFS cannot be used on a boot file system (the drive containing bootable Windows files). The ReFS partition is best used exclusively on storage volumes. Removable volumes such as USB flash drives cannot accommodate the ReFS partition because there is no available mechanism to convert a ReFS partition to another file system. ReFS, like NTFS, was built on the foundation of compatibility to make it easier to move data from NTFS to ReFS because of the inherited features like access control list, BitLocker, mount points, junction points, volume snapshots, symbolic links, and file IDs. Some of the lost features likely to be encountered when moving to ReFS are Object IDs, short names, extended IDs, compressions, quotas, hard links, user data transactions, and file level encryption. Some files or installed programs may not function as intended when ReFS is used on a non-server operating system. In the even that a ReFS partition fails, recovering the partition is not possible; all that can be done is data recovery. Presently, there is no recovery tool available for ReFS. The Resilient File System has unique advantages over the existing file system. It may have its own drawbacks, but that does not take away its self-healing power, file repairs without downtimes, resilience in the event of power failure, and its ability to accept huge file sizes and names longer that then usual 255 characters. File access on ReFS uses the same mechanisms NTFS uses. Most of the implementations of ReFS are to be used on systems with huge storage and rapid input/output demands. The ReFS cannot fully replace the NTFS because its design was intended for a specific work environment. Some of its features do not have full support, therefore system administrators aspiring to use ReFS may still have to wait for its full implementation.